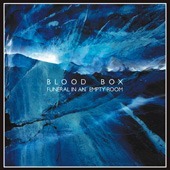 Seven years after the highly acclaimed Iron Dream CD (Eibon) and 14 years after the CD debut, A World of Hurt (Malignant/Katyn), Blood Box finally returns with a new album, Funeral In An Empty Room. As one part of revered dark ambient project Yen Pox, Michael JV Hensley is certainly no stranger to creating epic and immersive soundscapes, and with Funeral In An Empty Room, he has yet again meticulously crafted another highly detailed, intensely atmospheric work. Awash in slow, dreamlike waves of morphing textures, and blissfully unfurling cosmic drift, this is nothing less than an aural vision down the hypnotic path to the unknown; serene yet gloomy, with multiple layers of swelling tones, subdued melodies, and ominous, spacey effects. From time to time I am certain that sometimes it takes many years to create a really good music. The time passes and brings lots of new experiences which influence creativity process, pushing it to undiscovered corners of author’s imagination. Dark Ambient music stays as a projection of the inner world and needs to be cared with the maximum gentleness due to its abstract nature. While for the past few years it became much more popular, lots of newcomers just tried to copy-paste the well-known passages from the patriarchs of the scene, like Raison d’Etre, Sephiroth and so on. It is really hard to find good albums in this genre, and most of the CD’s sound the same; dull and boring. Though there is one label, that even in the hard times of Dark Ambient music, keeps working on releasing it and is following the phrase „less, but better“. Leipzig based Loki Foundation, the home of such monsters, like Inade, Herbst9 amongst others, brings to our consideration a new album from Blood Box called ‚Funeral in an Empty Room‘. Being a concentration of seven long years of Michael Hensley, more known by his participation in the other project Yen Pox, the album brings a huge boost to the whole scene. With almost eighty minutes of music, Michael makes his statement that the genre is definitely not dead, and seven years was worth the wait in order to receive such a massive experience. On ‚Funeral in an Empty Room‘ I can find everything to adore it for. Extremely dense layers control the atmosphere all the way inside out and it seems that there is no way to insert even a small piece to this music puzzle. The light melody follows the pass, sometimes even reminds the new-age melodies of Steve Roach, but as the album floats on, the sound becomes darker and darker to fulfill it’s name, when few parts evolve to be even more of ritualistic nature. A lot of things also happen above the general soundscape, dreamy waves wash morphing textures, little noises and scratches splash over and over, far chanting voices raise long forgotten and hidden memories. Music stays in constant transformation from track to track, and that makes the album very diverse, but without zealotry, since all the changes are kept light and gentle. I cannot mark out any specific track, because all of them are inseparable for the colorful canvas of thoughts and feeling, created by the mastermind of Michael Hensley. Sometimes the structures are so deep, they just span my spirit inside, make it airy and immaterial to such an extent, I even didn’t notice, that the CD had stopped. All that was left to be done, to push “Play” once again and immerse myself in to the floating space and time continuum, follow the pass of distant universes and join the funeral in an empty room, because this masterpiece will be played again and again for many years.